Three months ago, The ECB warned that "only a serious economic shock" would prompt them to unleash a new round of TLTRO. Today, ECB's Coeure (neutral) confirms that the economic slowdown is stronger and broader than what they expected, warning that the inflation path will be shallower, and adding that a new TLTRO is possible and the ECB are currently discussing it. 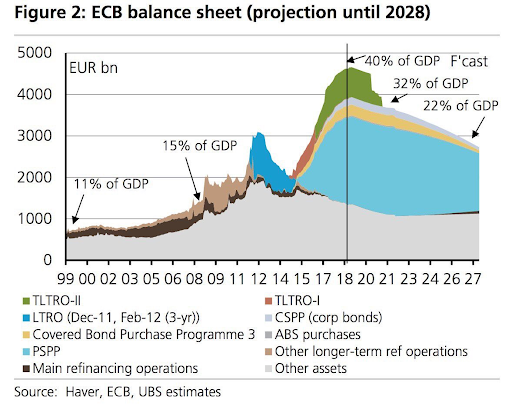 However, as we noted in November at the last jawboned effort, since nothing has been fixed in the Eurozone, the ECB will have no choice but launch a new T-LTRO, one which merely allows existing debt to be rolled over. However, by doing so it would confirm that the Eurozone has, in fact, triggered an "economic shock."